2016 Baseline China Fertility Forecast predicts births amidst changes to China’s one-child policy and slowing growth in the nation. The leading forecaster of U.S. births predicts impact of Chinese Communist Party policy changes will be small in Demographic Intelligence’s baseline forecast of births for China. How many babies will be born in China this year? Now, low rates of fertility prevailing across China have caused the government to reconsider the one-child policy. What will be the impact of China’s decision to lift the one-child policy? How many babies will be born in China this year? In a nation of over a billion people, with about 16 million births per year under the former one-child policy, what happens when that policy is lifted? The China Fertility Forecast 2016 Baseline Report, which provides national projections for Chinese births from 2015 to 2030, predicts that the impact of changes in the nation’s one-child policy will be modest. The report also includes detailed projections of Chinese births by mother’s age, province of residence, and education level from 2014 to 2017. "Until recently, the Chinese government believed that birth planning was necessary to prevent rampant overpopulation," said Ethan Sharygin, Ph.D., lead author of the report. "Now, low rates of fertility prevailing across the country have caused them to reconsider. Gradually birth restrictions have been lifted, which will have some short-term effects. Over a longer horizon, economic conditions and a changing age structure suggest that more births will be to older, well educated, and more established couples." Sharygin received his doctorate in demography from the University of Pennsylvania and recently served as a postdoctoral fellow at the University of Washington in Seattle. This Baseline Report by Demographic Intelligence is essential for businesses making strategic development plans for the China market, especially in the juvenile and healthcare sectors. A full understanding of China’s underlying demographics will assist planners and marketers in making wise decisions about future economic and demographic trends. 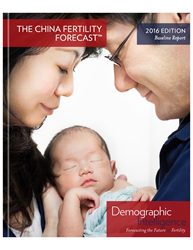 The China Fertility Forecast 2016 Baseline Report predicts births based on a statistical model that normalizes and reconciles data from several sources, including official Chinese data as well as results from academic and government research. Demographic Intelligence (DI) is the premier provider of U.S. wedding trends and birth forecasts for businesses with an interest in family trends in the United States, and birth forecasts in Europe and China. DI provides reports and consulting services to companies in the following sectors: jewelry, clothing, juvenile products, healthcare, media, financial services, consumer food, and household products. Demographic Intelligence is advised in its work by five leading demographers and sociologists: Princeton economist Alicia Adsera, University of Pennsylvania demographer Hans-Peter Kohler, University of North Carolina demographer Philip Morgan, University of Washington demographer Ethan Sharygin, and University of Virginia sociologist W. Bradford Wilcox, who directs the National Marriage Project at the University of Virginia.